It goes by many names: the hustle, the grind, going all in. Entrepreneurs wear their long work hours, dark under-eye circles, and stress-induced weight fluctuations like badges of honor. We look up to these people who sacrifice weekends and a good night’s rest as the dedicated few willing to do what it takes to achieve greatness. They seem almost superhuman, eternally the first ones in and last ones out. Often, however, we don’t see the personal relationships, self-care, and play — all necessary parts of a healthy, balanced life — that come at the price of these achievements. What might look like an admirable work ethic may actually be workaholism. Deciphering between a workaholic and someone with an incredible work ethic — say, a dedicated entrepreneur trying to launch her first business — isn’t easy. Most experts agree that workaholism is a matter of your mindset toward work. 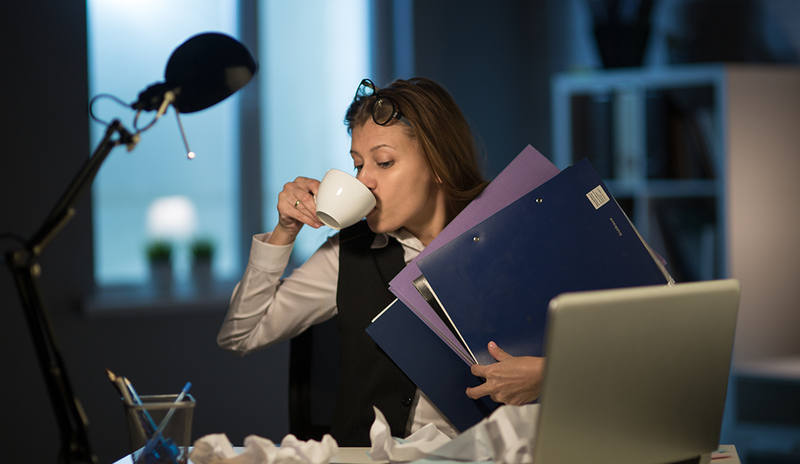 An entrepreneur must often clock long hours in the early stages of a business, but if they are able to detach and apply the same dedication to relaxation time, they are likely not experiencing symptoms of workaholism. Conversely, the entrepreneur who clocks long hours and still feels guilty about not accomplishing more, obsessively checks work emails, and regularly discusses work in casual conversation might need to take a second glance. Whatever the definition, an unhealthy work obsession has some pretty serious long-term consequences. Poor sleep, digestive issues, memory problems, excessive drinking, and chances of type 2 diabetes are all commonly cited side effects. Workaholism often manifests in those who struggle to find self-fulfillment and rest their egos on shaky foundations of social and peer approval. Struggling to delegate as leaders, they often come to believe that they are not only the best people for the task, but the only ones. Although the work-obsessed might seem like the most productive people in the room, a growing body of research shows that prolonged levels of strain on the brain and body lead to diminished levels of productivity over time. Those working around and under the overachiever might feel incompetent; they may eventually grow resentful, leading to an unhealthy or even toxic work environment. The workaholic becomes a victim of their own making, the subject of both admiration and sympathy. If you struggle to welcome and capitalize on opportunities to recharge, dream about work while on vacation, and spend sleepless nights obsessing over minor work-related issues, you might need to consider some serious changes. Scan your brain and body for signs of exhaustion and deprivation. If you’re having trouble, reach out to a trusted friend or relative. They might be better equipped to make an unbiased assessment. Workaholism doubles the risk of divorce. If you or your loved one observes a problem, sit down together and talk about it. Address any unmet needs. Map out what a healthy work/life balance looks like to your partner and compare it to yours. Keep track of these instances, especially during scheduled times of relaxation. Consider seeking professional help to address any underlying issues that could be contributing to your impulsive work habits. Also consider joining an established support group, such as Workaholics Anonymous. If your type of work doesn’t allow for long periods of disconnection, set aside times that you’re not to be disturbed. If need be, enlist a coworker or employee to field calls and emails during those times. For example, when you’re able to attend your child’s school play or spend a weekend at the lake with friends. “As someone who works a lot but also strives to be an excellent parent, I carry a lot of guilt. When I am at home, I feel guilty about not working; when I am working, I feel guilty about not being at home. My strategy is to continuously work on my internal peace so that I can be focused on the task at hand and disconnect when need be. “We all define balance in a uniquely personal way. To me, balance means not being able to go all in on any one thing. I was able to grow my business to over $1 million in revenue by year four, but I had to accept that I am unable to achieve 10 times that while being a present and dedicated parent to two children. I am an excellent parent, but I do not have time to volunteer weekly at my daughter’s school or bake for the semiannual bake sale as many other mothers do. Balance comes in the form of working 75-hour weeks but turning off all devices and focusing on family on the weekend. We all have our own structures. Accept that, own it, and stop feeling guilty about defining your own paths to success and happiness.” – Marina Byezhanova, cofounder and director of Pronexia, Inc.
“When I was in my early 20s, I won a sales contest and got to spend an afternoon with Jack Welch. He told me that he didn’t believe in work/life balance, but rather in work/life choices. This stuck with me and still resonates today. Ensuring you are choosing to work hard — and not a slave out of habit or lack of another model — is what separates a workaholic from a healthy hard worker or overachiever. “There is a give and take when you choose to prioritize anything in life. When stuck between a work and life event, I often use a simple technique to explore how I’ll feel about missing both events. I step into the future and I tell the story backward, as if I didn’t go to the event. If it’s an easy story to tell, it’s an event that you can likely miss. If you can’t tell the story with a good ending, then the event should take priority. “I love what I do, and being in the restaurant industry, it is hard to ever really turn it off. But if I don’t manage my work time well, it can have a negative effect on my personal life and relationship with my wife. At the end of the day, we only have so much time together. If you want a fruitful work and personal life, you have to make efforts to give quality time to both. It is not easy. My wife likes to sleep in on the weekends and enjoys our meals together. So, I wake up early to work and take care of other personal items, and I stay up late when she goes to sleep. I do my best to make it home for dinner together, then work afterward. You have to figure out what your partner needs most, and then work around their schedule. A version of this article originally appeared on SUCCESS.com and the Winter 2018 issue of SUCCESS magazine.